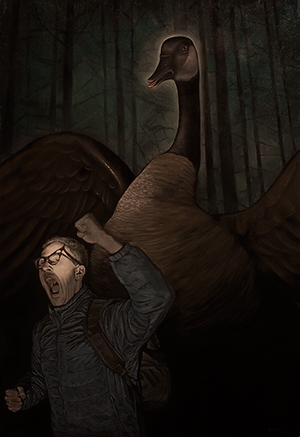 Big Goose, also known as binesi, is the name given to a terrifying winged goose-like creature that some people believe inhabits old-growth forests and other heavily wooded areas in and around the Pacific Northwest region of North Amercia. Big Goose is usually described as an enormous, feathery, bipedal anserine creature. Unlike Bigfoot, which are described as gentle creatures known to avoid human contact, Big Goose is said to be extremely aggressive and short-tempered. Big Goose is described as an extremely large goose-like creature, similar in appearance to a very large Canada Goose with a size in a range of 10 to 30 feet (3 – 9 m) tall, a wingspan in a range of 15 to 50 feet (5 - 15 m), weighing in excess of 1000 pounds (454 kg), and covered in large brown, white, gray, and black feathers. Much like the Canada Goose, Big Goose is often described as having a black head and neck with a white “chinstrap” and a large bill about 2 to 5 feet long (0.5 - 1.5 m). Big Goose is further described as having large black beady eyes which may glow due to luminescence during certain conditions, such as when the creature is agitated, excited, or startled. Big Goose is commonly reported to exude a peculiar odor when encountered. Further, those who have come in close proximity to Big Goose report unusual pressure changes occurring in the vicinity of the creature. Reports indicate that air pressure in the vicinity of Big Goose may decrease, causing a vacuum effect which draws objects towards the beast and leads to shortness of breath. Proponents suggest that Big Goose is capable of emitting a pheromone when startled or agitated, and that the vacuum effect may be due to subtle movements within the plumage of the beast. Big Goose is said to be a scavenger, feeding on mushrooms, animal carcasses, rodents, and any animal or insect it encounters. Its flexible, snake-like neck is capable of very quick, unexpected movement which may be used to strike out at nearby creatures. One strike from its massive, sharp beak is said to be deadly. Some have claimed that Big Goose is venomous. As remarked above, unlike Bigfoot, Big Goose is purported to be aggressive and short-tempered, and may further harbor a particular disdain for humans. Big Goose is thought to be extremely territorial and can become quite aggressive when something intersects its path. However, the forest flora greatly impedes movement of the beast due to its massive, cumbersome body. When agitated or startled, Big Goose is known to spread and flap its wings further reducing its mobility through the forest. Thus, experts recommend running away as quickly as possible upon encountering Big Goose. 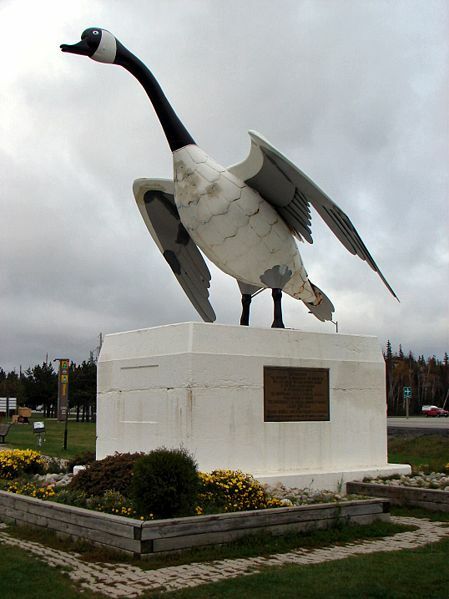 An enormous Goose sculpture in Wawa, Ontario built in 1960. Wawa means Land of the Big Goose in Ojibwe. Big Goose is known through Native American oral tradition from the Great Lakes region. In particular, oral history of the Ojibwe people describes a legendary creature called binesi that is considered to be a "supernatural" bird of great power and awesome strength. Depending on the people telling the story, Big Goose is either a singular entity or a species. In both cases, it is intelligent, powerful, and wrathful. All agree one should go out of one's way to keep from getting binesi angry. The earliest written records of Big Goose were recorded in the 15th century in journals kept by French voyageurs who encountered the native Ojibwe people in a region of Ontario near Lake Superior, specifically, near the Township of Michipicoten or modern day Wawa, Ontario. This region is known as the Land of the Big Goose. These French voyageurs transported furs and other merchandise over long distances in the lake and river system of northern America. They were mainly trappers and traders rather than settlers, and in general got along with the native people much better than the English did. Voyageurs learned to communicate with the indigenous tribes about their customs and legends, including the legend of binesi or Big Goose. 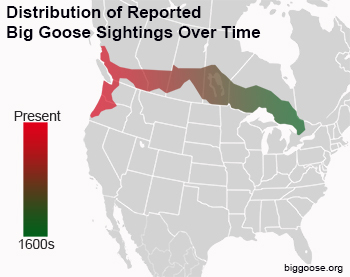 Distribution of reported Big Goose sightings in North America over time, suggesting a migration of Big Goose from the Great Lake Region to the Pacific Northwest over a period of 400 years. According to reports since that time, it has been speculated that Big Goose slowly migrated westward from the Great Lakes region towards the Pacific Northwest region. For example, sporadic reports of encounters with a “very large goose” from fur traders were recorded in the 1850s near modern day Winnepeg in Manitoba, Canada. Later, after settling in modern day Calgary in 1873, John Glenn made records of “a spectacular goose-beast” appearing in the area. He even attributed the idea to build his historic irrigation system to the beast. The early 1900s saw an increase in reports of Big Goose encounters from loggers and fur traders in the Pacific Northwest throughout British Columbia, Washington, and Oregon. Reports of Big Goose were typically written off as imaginary or sensational. In 1935, the first known newspaper report of Big Goose was published in the The Seattle Star. In response to this report, others from regions of Oregon and Washington wrote with their own, separate sightings of Big Goose. Some described Big Goose as a human-like creature with feathered clothing or skin. Others described Big Goose as simply “a big goose.” Throughout the 1930s-1980s, the Big Goose legend was widely considered a local, colorful tradition of Pacific Northwest folklore. However, in 1982, a photograph was captured by an Oregon mill-worker named John Daniel Evans claiming to show Big Goose in Tillamook Forest. 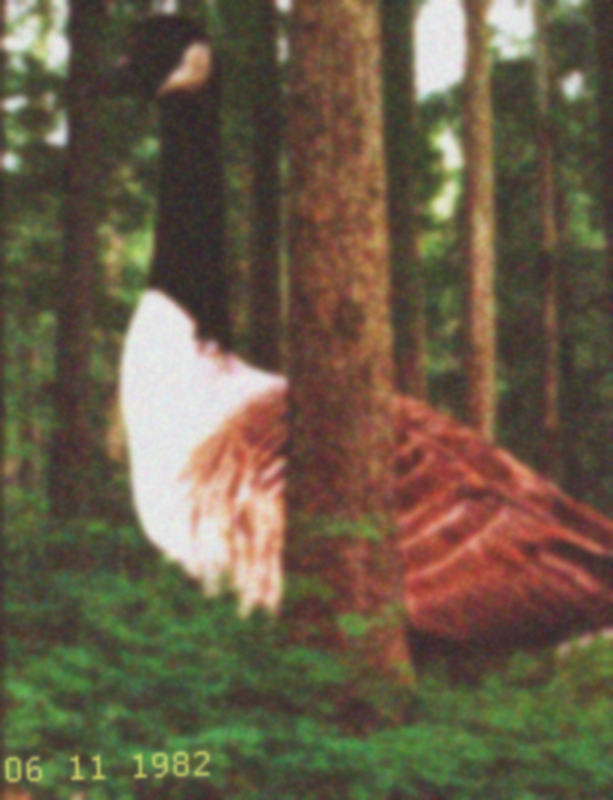 Photo of an unidentified animal taken in 1982 and claimed to be “Big Goose.” Some authorities believe this is merely a photograph of a regular goose standing in a forest. However, others note that if this were the case then the tree in the foreground would have to be a mature yet miniature Douglas-fir, and such miniature Douglas-firs have never been identified. In 1995, the first film purporting to show Big Goose surfaced. The short, poor-quality film was taken by a family camping in Tillamook Forest. The 35-second film shows a large creature with a human-like gait, but with visible wing-like features and an unmistakable beak. Skeptics immediately argued that the film was a hoax, pointing out that anyone could have donned a “Big Goose” costume for the poor-quality film. Believers in the Big Goose legend point to the film as just one of many pieces of evidence for the creature’s existence. Unfortunately, this film was destroyed in a fire in 1996 and no duplicates were ever made. After 1996, the number of reports of Big Goose encounters began to increase. They often placed Big Goose in and around the Tillamook State Forest in Oregon, suggesting that the creature had, at least temporarily, settled there. Proponents have speculated that the dense and vast expanse of the Tillamook Forest region together with its proximity to the Pacific Ocean makes for an ideal environment for Big Goose. In 1998, Tom Swanson was camping with his family in Tillamook Forest and reportedly encountered Big Goose after wandering off from the camp at dusk. Tom described an eerie, sudden silence muting all nearby forest sounds. He then described feeling as if he were in a “dark vortex” which extinguished his flashlight only seconds after he spotted a massive, terrifying goose head lunging toward him. He dropped his flashlight and sprinted back to the camp, hearing terrible rustling noises following him from behind. Upon arriving back at camp, he immediately packed up his family and headed home. He says he will never step foot into a forest ever again. In 2011, Jenny Davenport, an attorney, and Craig Hastings, a software engineer, both from Portland, Oregon, described exploring the Tillamook Forest in October looking for chanterelle mushrooms. They were in a heavily forested area darkened by the forest canopy, following a small path towards an area where chanterelles are known to grow. She and Craig wandered off the path searching for mushrooms, only to realize that they had suddenly become disoriented and could not figure out the way back to the path. The forest suddenly seemed to shift and have the appearance of being the same in all directions. They set off in a direction they thought would lead them back to the path, but quickly realized that they were still lost.They began to panic and set off in a different direction when they heard a deep, slow, rustling sound as if a "tank were moving through the forest." The rustling sound stopped suddenly and they reported feeling a very cold, tingling sensation which caused them to break out in goose bumps and freeze in their steps. They looked up to see an enormous goose with glowing eyes towering above them, looking extremely agitated. Terrified, they both immediately fled in the opposite direction and were fortunate to again find the path just a few yards away. They ran back to their vehicle and have never again returned to the forest. Various types of creatures have been suggested to explain both the sightings and what type of creature Big Goose would be if it existed. However, because of the lack of physical evidence, most scientists discount the existence of Big Goose and consider it to be a combination of folklore, misidentification, hoax, or manifestations of ornithophobia. Some skeptics attribute Big Goose sightings to manifestations of ornithophobia. Those who have reported encounters with Big Goose describe phobic symptoms, such as: breathlessness, dizziness, excessive sweating, nausea, dry mouth, feeling sick, shaking, heart palpitations, inability to speak or think clearly, a fear of dying, becoming mad or losing control, or a full-blown anxiety attack. It is suggested that, upon seeing a regular goose, people suffering from ornithophobia may experience the event out of proportion, consistent with known descriptions of a Big Goose encounter. Both scientists and Big Goose believers agree that many of the sightings are hoaxes or misidentified animals. For example, many photographs of Big Goose have been identified as merely photographs of a regular goose in normal situations or photographs of humans wearing elaborate goose costumes and prancing about. 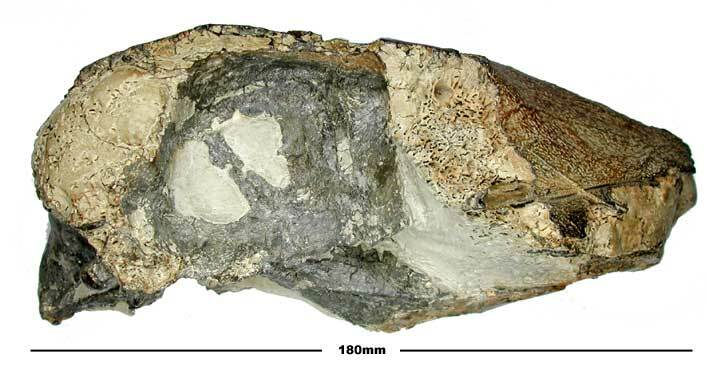 Fossil jaw belonging to a huge ancient goose in the purportedly extinct genus Dasornis. Some proponents suggest that Big Goose is a descendent of a relict population of Dasornis. Some Big Goose proponents believe that Big Goose could be a relict population of Dasornis or some other Pelagornithidae. Others have postulated that Big Goose may be a distant relative of Argentavis magnificens. Other explanations for the Big Goose phenomenon have been proposed which attribute Big Goose to UFOs, drug use, supernatural activity, or other paranormal causes. One fringe theory, supported by paranormal investigator Jon-Erik Beckjord, theorizes that the lack of hard evidence supporting Big Goose's existence indicates that the creature is an interdimensional being that slips in and out of dimensions. Many Big Goose advocates distance themselves from the paranormal position and regard it as an embarrassment. Lynch, Rena. "[Goose] attacks Illinois caretaker until he drowns." Los Angeles Times 16 April, 2012. Turcott, Agnes. Land of the Big Goose: A History of Wawa and the Michipicoten Area from 1622 to 1960. Alex Wilson Publications, 1960. "Big Goose" and "Legend of Big Goose" are trademarks of bijijoo. All content copyright © 2012-2013 by bijijoo unless otherwise specified. Contact bijijoo. Created, curated, and maintained by bijijoo. Special thanks to Maija Anderson for her contributions.